Day three of our trip was the "free day" in London. Nothing was scheduled except for the West End show at 6:45pm. We were free to sightsee however we pleased in the meantime, and Sophie gave us all London maps and Tube guides and had us circle the important spots we wanted to get to. Sophie and Jan took some of us onto the tour bus to drop us off at important places. I tried to rest my foot as much as I could the night before (by ... not walking in my sleep), but the moment I stepped off the tour bus at Westminster, pain shot up my right foot. Yowch! I could barely rest any of my weight on it. It felt like I'd hurt a bone. I started to limp, than hobble, past the Houses of Parliament, towards the bridge I would have to cross to make it to the London Eye. Not pictured: my painful foot. I tried to stay cheerful. It was a beautiful day, I was surrounded by beautiful, iconic buildings, and so what if I was walking slowly? But the voracious traveller in me was determined to see ALL THE THINGS. I didn't want to take time out of my day to rest or see a doctor and as I was unfamiliar with pretty much all injuries caused by physical activity (due to me shunning it most of the time), I had no idea what to do. I asked a couple of questions to my Twitter followers on my phone and limped towards the Eye. A very, very, very long walk. I made it to the Eye, realized I'd only paid for the "regular" ticket and not the FastPass, looked at the 40-minute wait in the hot July sun and went, "Oh, HELL no." Several pounds lighter, I skipped the line thanks to my advanced pass and boarded the London Eye immediately. I freaking loved the London Eye. Yes, it's a very touristy thing to do, but it's not as cheesy to me as, say, going up the Eiffel Tower because the whole point of the Eye is to look out over the city of London from 360 degrees. It's an excellent and creative way to see the city, and for a pound they'll give you a handy circular map that points out all the buildings you're seeing. It's about a 30-minute ride, perfectly timed. 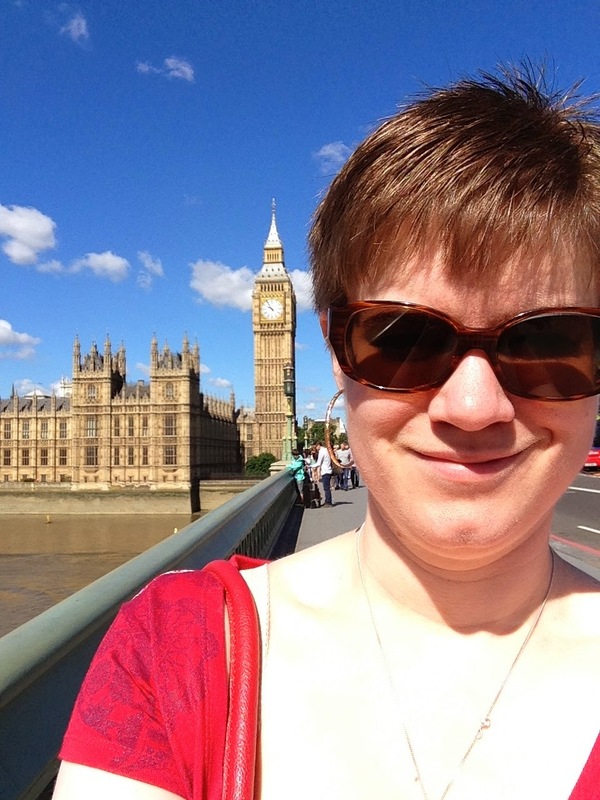 Once I had one and a half working feet back on solid ground, I hobbled back to the bridge towards Westminster Abbey. My Twitter followers recommended rest (nope), ice (nope again), or wrapping it up in an ace bandage (okay!). I tried to Google the nearest chemist but the closest one was a kilometre's walk away, due to all the crazy-old and famous buildings getting in the way. I loved my time in England, but if I had to pick a low point, it was probably the next forty-five minutes I spent in Westminster, hobbling in circles trying to find a cross-walk (hint: it is never where you want a crosswalk to be), ultimately deciding to nix Westminster Abbey due to a 30-minute line, and limping towards the nearest Underground station. I was by myself in an area I didn't know at all, where I couldn't walk very quickly or without pain, and had no idea what to do next. But still - I felt frustrated and angry, but not anxious, panicked, or depressed. Huh. After a convenience store clerk's terrible directions led me on a laborious, failed trek to find a Boots, I decided to take a page from the Little Mermaid's book (the Hans Christian Anderson version). I'd simply walk through the pain. I wasn't going to miss London (particularly the parts I'd already paid for in advance). I wasn't going to die. I could always stay in bed during the Paris part. So I descended back into the Underground and took the train to the Tower of London. Which turned out to be the best decision ever. A little background - I work with case managers in disability insurance, and a big part of their job is determining if the claimant is legitimately too ill/injured to perform their job, or whether they just hate their current situation too much to put up with pain they'd normally be able to. 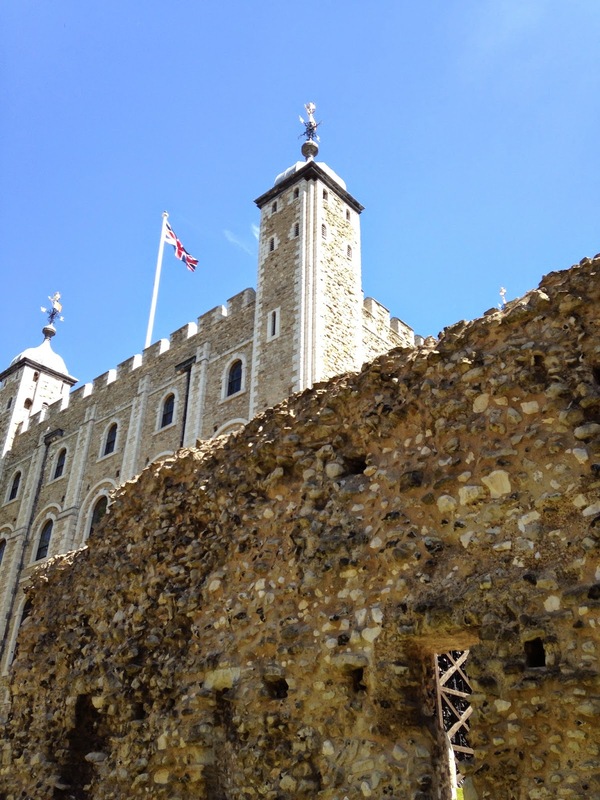 As it turned out, I was the latter - the moment I approached the enormous fortress of the Tower of London, the throbbing in my foot faded to a mere annoyance. I'll be honest - I was extremely ignorant of the Tower of London before I actually visited it so I didn't know what to expect. I certainly hadn't expected this gigantic walled edifice with towers (both authentic and rebuilt in the 19th century) and moats and a medieval palace. It's even more surreal and impressive since it's surrounded by ultra-modern skyscrapers such as the Shard and the Gherkin. I had a blast at the Tower. I cannot recommend it enough. Despite being there at the height of tourist season, I discovered it's such a large attraction that there weren't too many lines for anything except for the Crown Jewels (which I skipped - I'm not spending 40 minutes in the sun just to see sparkly things). I explored the medieval palace originally built for Edward the First, I saw the preserved graffiti of various prisoners (lots of Jesuits, Elizabeth I's tutor, and a man tried for witchcraft) and the Traitor's Gate. Also went into the torture tower (because of course I did) - my favourite replica was the Scavenger's Daughter, which functions as the opposite of a rack. You make a man fold himself into a ball then put an iron hoop around him and screw it tighter and tighter. Another thing I learned? 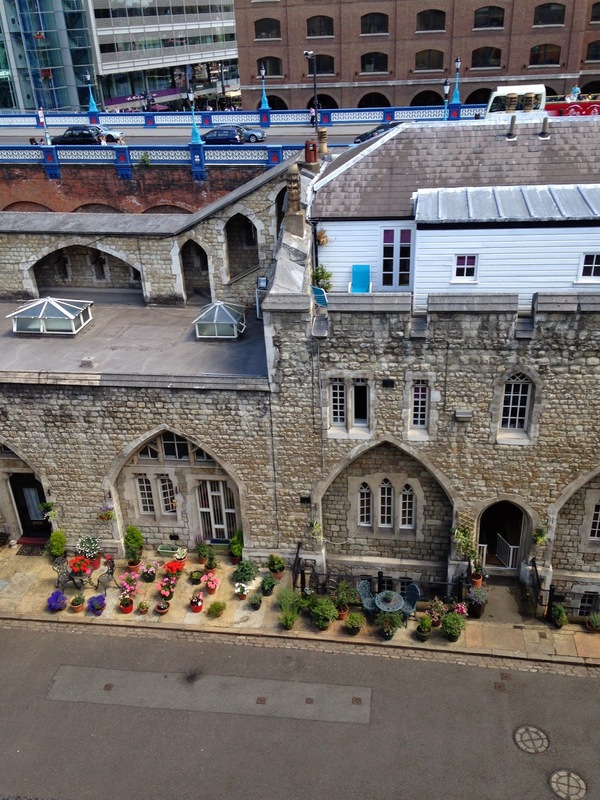 The yeoman warders actually live at the Tower with their families. Bit of a shock to see a modern deckchair and flower pots by these beautiful stone buildings just beyond one of the major walls. Some of the residences are actually on the green, with only a single chain and a sign to indicate they're off-limits to visitors. I can't imagine living at such a popular attraction, but then, it's still technically a functioning prison and the home of 2.5 billion Euros' worth of jewellery. Eventually, even the joy of exploring a royal palace couldn't keep the pain of my foot at bay any longer, so I walked outside, bought a whole mess of fish and chips (the chips liberally doused in brown malt vinegar!) and ate it next to the Tower in the hot sun. Blissful - and probably the meal I enjoyed the most out of the entire trip. I saw everything except the actual tower of the Tower of London - the White Tower, and while I felt a bit sad about that, I wanted to see more of London before the West End show. I limped back to the Underground and rode the train to High Street Kensington station. I should also note that I loved the Underground - so convenient and easy. And a billion times more accessible and visible than Paris' Metro. At High Street Kensington station, I found a Boots! I bought an ace bandage - then realized I had no scissors to cut it with. 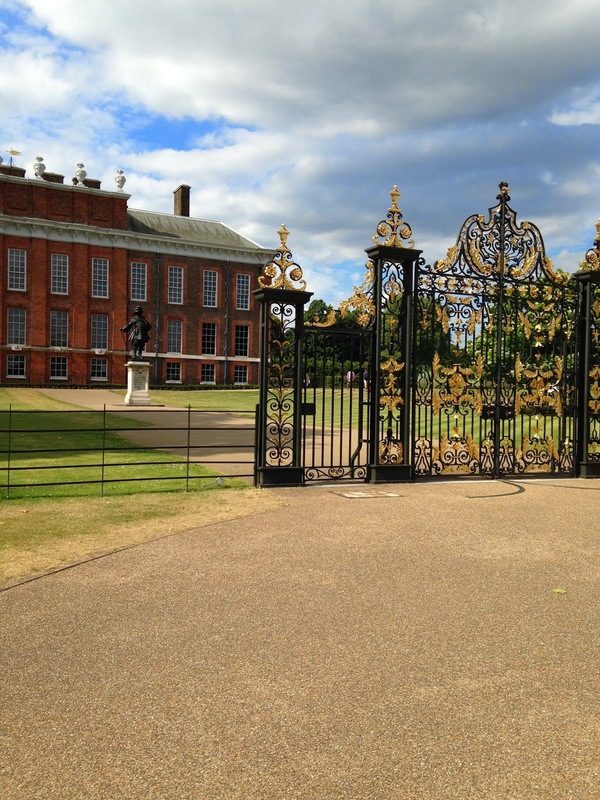 I dragged myself five more blocks to Kensington Park and finally, to Kensington Palace. Kensington Palace was where Princess Victoria lived, and is the official London residence of Prince Harry and the Duke and Duchess of Cambridge. I'm still baffled as to why no one has bothered to write a sitcom around this idea with a fictionalized Royal Family. But whatevs! 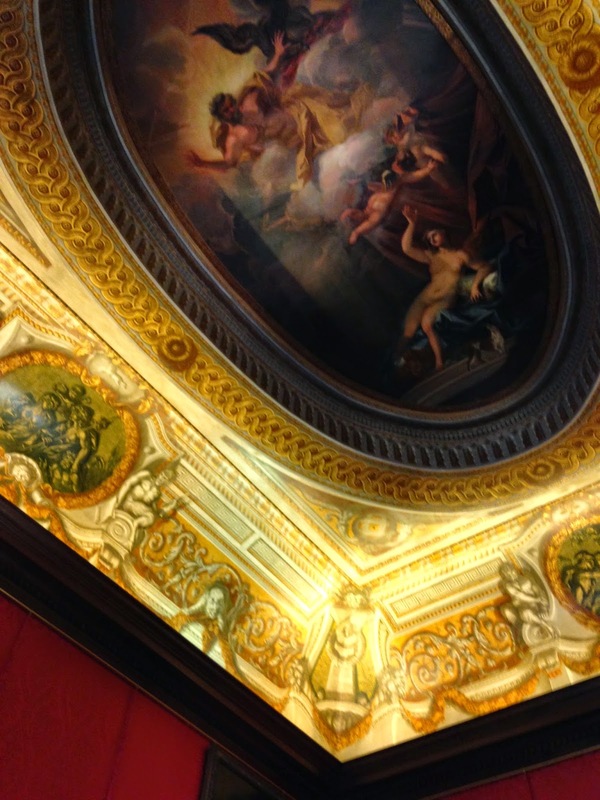 There are four historical routes through the palace - the Glorious Georges through the King's Apartments, William and Mary's life together in the Queen's Apartments, a tour through Queen Victoria's life, and a section dedicated to the fashions of Queen Elizabeth II and Princess Margaret. I enjoyed it (particularly the Victoria parts), although the part of me that was expecting the building to be kept up in the Georgian style was disappointed. I was rather hoping to walk in and pretend I'd time-travelled back to Victorian Britain but only certain parts of the palace were kept that way. The rest is a museum - and an excellent, well-organized one, but no longer a palace. It certainly made me want to rewatch The Young Victoria, though! When I go back to England (and I will!) I'll be sure to explore what looked like fabulous gardens, but once I made it out of the gift shop (bought: a classy key ring, the souvenir guidebook, and a history book on the Georgians), I knew it was time to drag my excruciatingly painful, blister-ridden feet back to the hotel in time for the show. I made it with 15 minutes to spare. Some of my tour mates decided to skip the show (even though it was already paid for in the tour price), but for me, a guaranteed two and a half hours sitting down sounded like heaven. The show was Mamma Mia, and honestly where else can you book 50 tickets only a month in advance? The only things remarkable about it were a scene where the heroine's boyfriend is forcibly stripped down to his skivvies (and the whole theatre squealed like the studio audience for Saved By the Bell) and the actor who played Bill's horrific excuse for an American accent. But I got to sit down, the music was nice, and I was in good company. During the intermission, I made friends with Lisa and Melissa (from Scarborough!) and Christina (from Long Island). After the show, I decided (again...) not to go out to the bar because I was completely exhausted and a bit worried about what state my feet would be in when I woke up again.